What’s one way to avoid high peak usage charges? Vic Shao, CEO of GreenCharge Networks, says in this podcast interview that energy storage can solve the problem, especially when it’s combined with predictive analytics. By predicting peak usage, and using energy storage to change energy usage during peak usage, customers can save money and utilities can avoid building peaking plants. He also addresses legislation affecting energy storage, noting that Hawaii, New York and California are at the forefront of energy storage. Patrick Lee, president of PXiSE Energy Solutions, explores the value of sharing microgrid resources with the main grid and using intelligent microgrid optimization technology. 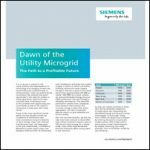 This includes sharing a microgrid’s resources with the utility or other power consumers in the network, outside of the facility in which it is installed.